Startupbootcamp FinTech, the leading accelerator focused on financial innovation, has announced the 10 international startups selected to join its Singapore program. The finalists, which include teams from across Asia-Pacific have been chosen by a panel of industry experts, including representatives from Startupbootcamp FinTech’s partners. SETScope is a platform that evaluates stock using multiple metrics like a human expert. Founder & CEO Tanin Sammanee first attended Startupbootcamp’s Bangkok FastTrack in 2015 where he gained mentorship from local finance and startup executives. 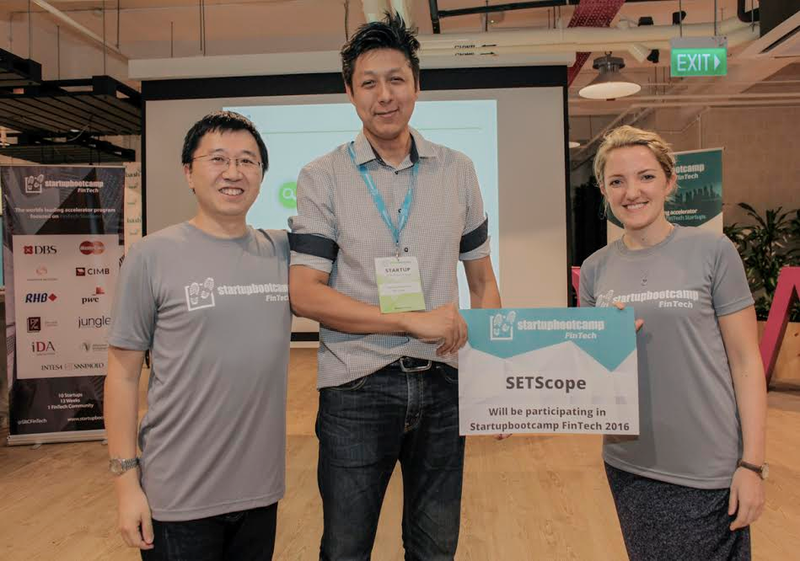 After follow up interviews with Startupbootcamp, SETScope was shortlisted as one of the top 20 startup in the region and was invited to attend the Selection Days in Singapore. After 4 days of workshops, pitch training, partner & mentor one-on-ones, the top 10 startups were selected. They will join the ever-expanding list of successful startups that have been through the Startupbootcamp programs globally. From the 18 April, the successful startups will benefit from extensive mentorship from 400+ entrepreneurs, investors and corporate partners, helping to guide each company through the ‘Shape’, ‘Build’ and ‘Sell’ stages of development and scaling across Southeast Asia. A series of masterclasses are offered on topics ranging from lean to legal, and focused partner days on leadership and investments. As well as access to mentorship, each team will receive SGD$25,000 and four months free office space at Singapore’s startup hub BASH at Block 79. Partnerships with MasterCard, CIMB, RHB, DBS, Intesa SanPaolo, Thomson Reuters, PwC, Pix Vine Capital, Jungle Ventures, [email protected] and Infocomm Investments will also provide the Startupbootcamp FinTech finalists with access to potential pilot customers, industry data, and capital. Startupbootcamp FinTech is also supported by MAS who will provide feedback to the startups on regulatory matters. After three months of acceleration, SETScope along with the 9 startups will be invited to present their companies to 500+ investors, mentors and partners during Demo Day. Founded in December 2014, SETScope is the 1st platform that evaluates stocks using multiple metrics like HUMAN EXPERT. Empowering the user to make quality decision effortlessly. CEO: Tanin Sammanee – 10+ years in world class stock / mutual fund platforms, 14+ years in software development / digital marketing. Co-founder of 2 software / SaaS businesses. CTO: Wirat Leenavonganan – 10+ years in world class stock / mutual fund platforms, 17+ years in software / project management (PMP). Co-founder of 2 software / SaaS businesses. Launched in 2014, Startupbootcamp FinTech is the leading FinTech accelerator, and the only programme of its kind to attract such wide industry support. Based in London, New York and Singapore, its partners include Lloyds Banking Group, MasterCard, Rabobank, Thomson Reuters, Bank of Scotland, arvato Financial Services, Halifax, My Order, DLL Financial Solutions, MJ Hudson, Route66 Ventures, Deutsche Bank, WilmerHale, Grind, Intesa Sanpaolo, DBS Bank, RHB Bank, CIMB Bank, PwC, [email protected], Infocomm Investments, Jungle Ventures and Pix Vine Capital, as well as an extensive mentor and alumni network from more than 50 countries across the globe. The award-winning accelerator offers FinTech startups access to world class industry expertise during an intensive three month programme. At the end of the programme, startups pitch at Demo Day to more than 500 investors and individuals from the financial services industry. Founded in 2010, Startupbootcamp is a global startup accelerator with 13 programs in Amsterdam, Barcelona, Berlin, Eindhoven, Istanbul, London, Miami, New York and Singapore, and a mentor and alumni network in more than 30 countries. More than 300 startups have been accelerated by Startupbootcamp of which 79% are still active. For more information visit.